The Research M&E and Communication collects and analyses information and then makes it available for the whole NGO Forum in reliable, comprehensive, evidence-based reports. 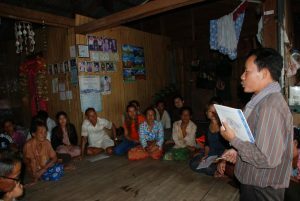 Its work supports members’ advocacy, with the ultimate goal of benefitting poor and vulnerable people in Cambodia. Making research and data available for NGO Forum Programmes, members, networks, stakeholders, and researchers on issues around land, land disputes and economic land concessions (ELCs), natural resources, development and fiscal policy. Providing effective information technology services including a website, email, telephone, computer and network and security support to all NGO Forum staff. Research provides a base for awareness-raising work in these two Programmes. The research officer works closely with project coordinators in drafting terms of reference, monitoring research processes and working with consultants. Investigations for the Programmes include site visits and interviews with relevant stakeholders, including affected people. Information is organized, documented, analysed and made available for advocacy. The GIS officer provides statistical analysis on land disputes and ELC data from different sources and applies Geographic Information System (GIS) technology to identify locations of disputes and ELCs. All the Centre’s work is sensitive to gender and climate change issues.